SMELLEZE Natural Chemical Odor Remover Granules: 25 lb. 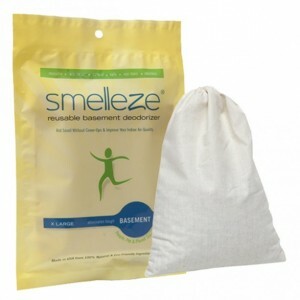 Bag Sprinkle on Odor Summary Smelleze® Natural Chemical Odor Eliminator Powder can help. Instead of just covering up noxious chemical odors, our amazing non-flammable stink removing granules absorb and encapsulate the toxic smells and pollutants so you can dispose of them safely. Features & Benefits • The simplest & fastest way to eradicate toxic chemical odors permanently at the source • Just sprinkle eco-friendly granules on chemical odor source or spill and smell the difference • Absorbs harmful chemicals & cleans the air for healthier indoor air quality • Non-toxic, unscented, non-caustic, all-natural. 100% Safe for people, pets, plants and the planet • For houses, cars, offices & businesses. Proudly made in USA - 100% satisfaction guaranteed! • Proudly made in USA The All-Natural Solution to Toxic Chemical Smells & Spills There are a large number of common materials that out gas harmful chemicals that permeate our homes and businesses such as newly finished polyurethane coated hardwood floors, new carpets and furniture, gasoline and chemical spills, pesticide and fertilizer applications, paints and varnishes, perfumes and shampoos, building materials, cleaners, mothballs, new car interiors, and even air fresheners. 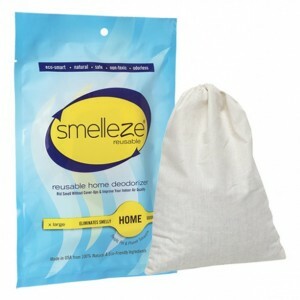 Smelleze® Natural Chemical Odor Eliminator Powder Powders are specially designed to capture and eliminate harsh chemical odors from any surface like a new carpet or hardwood floor as well as airborne chemical smells that may cause everything from rapid heartbeats and dizziness, to nausea and disease. To remove toxic chemical smell and improve your indoor air quality, simply sprinkle Smelleze® granules or powder directly on the chemical odor source or spill, vacuum or clean the surface after 4-48 hours, and repeat if necessary until the odor is gone completely. For a one-two punch that stops chemical odors dead in their tracks, use these chemical absorbent granules on surfaces in conjunction with our popular Smelleze® Reusable Chemical Smell Deodorizer Pouches to eliminate airborne contaminants. 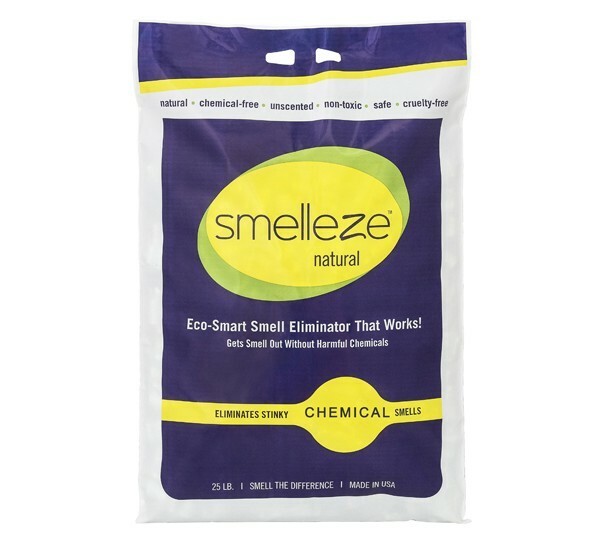 Smelleze® Natural Chemical Odor Eliminator Powder Powders are non-flammable, non-hazardous, and the safest way to remove both chemical spills and odors from your home. If you need a product that really works to clean up chemical malodors plus chemical spills in your home or business, and improves your indoor air quality dramatically at the same time, it's time to use our revolutionary Smelleze® granules or powder. Proudly made in USA and 100% satisfaction guaranteed!